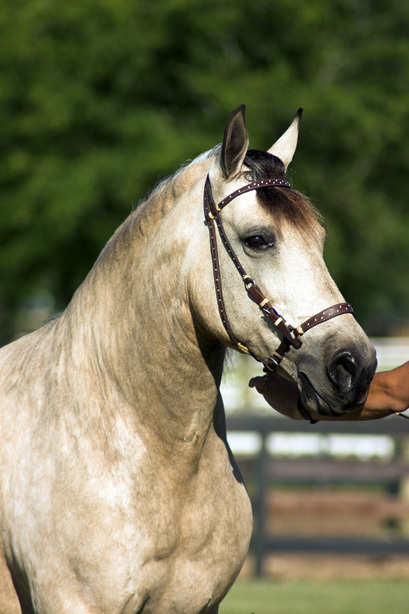 A gorgeous dappled buckskin mare. Her bloodlines are double Contrapunto, double Desvelo, double Delirio, and Florete. She exhibits excellent hock action with symmetry and quickness. Definitely FINO. Incredible producer! Macarena's filly with Sonajero de La Esmeralda - La Millennia de Colores is a multi Grand National Champion in Fino as well as Bellas Formas. 1995: GA PFOBA High Point Fino Horse, GA PFOBA High Point Fino Mare, GA PFOBA High Point Mare. In foal to Imponente de LaLibertad - had buckskin filly - Porcelana de Colores. Bred to El Classico de Plebeyo - had gray filly- Classica de Colores. Bred to Resortin de Profeta - had palomino colt - Resortin de Colores 2/27/08. 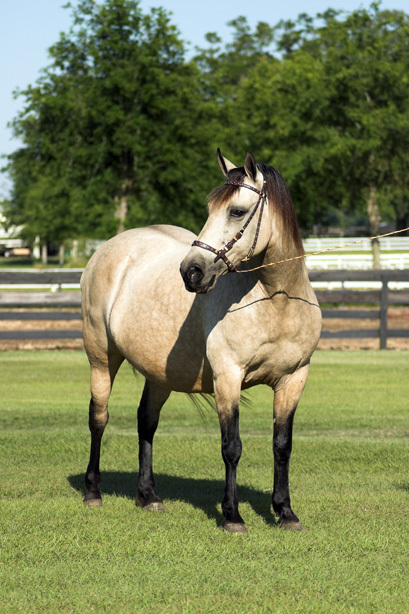 Bred to El Aprendiz de Colores - had buckskin colt 4/23/09. Breeding to El Aprendiz de Colores for 2011 in utero foal.